Have you ever considered remodeling your bathroom? Well you must have thought of that a thousand times but there’s just not enough money to have it done, right? Remodeling your bathroom is not that easy, but take note that there are lots of ways you can do to make it done. 1. Assess the type of remodelling you need to do. The first step to affordably remodel your bathroom is to evaluate what type of remodelling is necessary. Some people just tend to get their bathrooms remodelled without any clear cut plan so they end up spending more for what is really necessary. Take note that the type of remodelling your will do for your bathroom will need a specific budget. Try to assess whether you really need to get everything remodelled or simply just portions of the bathroom such as the floor material. Usually, having everything remodelled would cost more than getting only parts of the bathroom done. 2. Stick to your budget. Once you have carefully identified the type of remodelling you need for your bathroom, the next step is to think of your budget and make sure that you stick to it. Materials and labor cost are the major financial issues you need to address. In order to save money, you can simply opt for cheaper materials but make sure that they are of good quality. You also have to consider the material, it is easy to set up labor cost would also be less. 3. Save up. In order to meet your budget, you also have to save your money for the remodelling cost. Why not save at least 15 percent of your salary every month? You can also avoid spending money on “luxuries” or things which you really do not need at home. It will help a lot if you set aside a portion of your money because you can never really tell in case there are things that need to be repaired when you have your bathroom remodelled. 4. Check costs on your location. Usually, cost of living would determine the cost of hiring contractors to remodel your bathroom. For example, in high end cities like New York, a contractor may charge as high as $75 an hour. In other states, it could be as low as $25 an hour. These are the factors you also need to consider when setting your budget. If you live in a state with higher cost of living, you can opt to remodel your bathroom yourself or seek the help of friends who know how to remodel. This can help you save on labor costs. 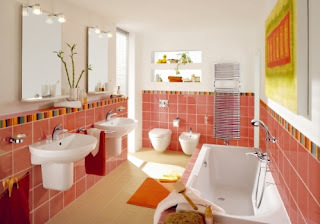 Remodeling your bathroom can be done even with the looming economic recession. Just try to follow these tips and you will definitely get things done. This is a guest post written by HowtoGetFinanced.com. Here, you will find all sorts of advice when it comes to your finances. Good tips. We SO NEED to re-vamp our master bathroom. It probably wouldn't take too much, just a lot of work. Love your tips!